Junior Caitlin Lien qualified for state speech again, while junior Emily Mehr and senior Amanda Kern are alternates. Junior Caitlin Lien qualified for the Class A state speech meet by placing third in informative speech at the Section 5A speech meet at Sauk Centre on Saturday. Junior Emily Mehr placed fourth in humorous speech, and senior Amanda Kern placed fifth in extemporaneous reading. Both are state alternates. Lien advances to state in speech for the second straight year. Last year, she also placed third at sections in informative speech. Her topic last year was "Dreams," while her topic this year is "Alexander the Great." Junior Caitlin Lien (center) qualified for the state speech meet again by finishing third at section. Junior Emily Mehr (left) place fourth at sections, and senior Amanda Kern (right) placed fifth. Both are state alternates. During her presentation, up to eight minutes, Lien describes the ancient Macedonian king, including his childhood, his reign as king, and his ten-year journey of conquest (from 334 to 325 B.C.) that took him from Greece to Africa and Asia and "immortalized him in history," said Lien. She researched her topic and wrote her speech, using photographs and diagrams to help her informative presentation. She had placed first at subsections two weeks ago. Mehr placed fourth at sections for the second straight year in humorous speech and is a state alternate again. Her speech this year is based on a Monty Python skit, "Election Night Special." Last year, she used another Python skit, "The Argument Clinic." Kern placed fifth in sections in extemporaneous reading, an event in which competitors draw a story (from 15 in all) and then have to read it while being judged on their expressiveness. Lien will become the ninth PAHS student to compete at the state speech meet in the past four years. In 2002, Melissa Andrie and Hannah Felling competed at state. In 2003, Courtney Colbert, Peter Schreifels, and Sami Tierney competed at state. 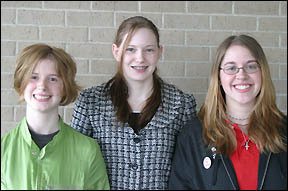 And in 2004, Andrie, Callie Frieler, and Lien competed at state. The Class A state speech meet will be held on Saturday, April 16, at Bloomington Jefferson High School. The schedule is: 8:30 a.m., first round begins; 10:15 a.m., second round begins; 12 noon, third round begins; 1 p.m., lunch; 2:45 p.m., championship finals begin; and 4:30 p.m., awards presentation.